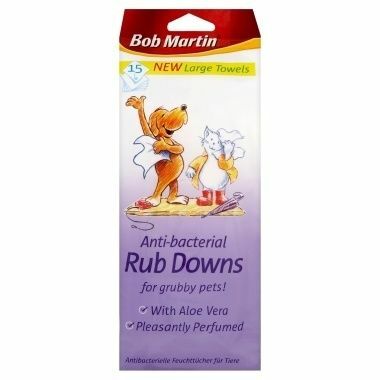 Bob Martin Rub Downs are the quick and easy way to keep your pet clean and fresh. Rub Downs remove dirt loose hair and odour easily without the need for water or rinsing leaving your pet's coat shiny and clean. Safe and gentle on your pet each wipe contains Vitamins A and E to help maintain healthy skin and Aloe Vera for its soothing properties. Rub Downs can be used hot or cold - ideal for pets that dislike bathing and convenient to use at any time.